Trump’s National Security Advisor Flynn resigned after only three weeks in office. While I am certainly no fan of Flynn or of Trump I find this defenestration a dangerous event. It will hamper any big change in U.S. foreign policy that Trump may envision. President Barack Obama was caught on camera on Monday assuring outgoing Russian President Dmitry Medvedev that he will have “more flexibility” to deal with contentious issues like missile defense after the U.S. presidential election. Despite tens or hundreds of claimed White House leaks in the media I am still not sure what really happened next. Trump’s enemies and some intelligence officials accused Flynn of lying about the phone calls with the Russian ambassador. It is unclear what the alleged lies really are and especially why they should matter. Obfuscation is part of any White House business. If Flynn had secretly talked with the Israeli ambassador (which he probably did) no one would have attacked him. So why was Flynn really under pressure and why didn’t Trump back him? It would have been easy for Trump to say: “I ordered Flynn to do that. Obama did similar. In both cases it was a GREAT success. USA! USA! USA!” Nobody would have been able to further attack Flynn over the issue after such a protective move. 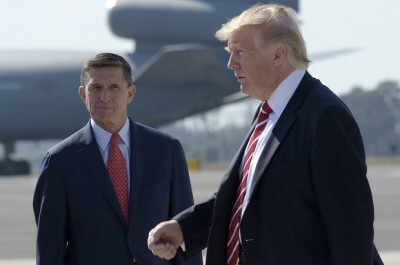 As it looks now a rather small gang of current and former intelligence officials – with the help of the anti-Trump media – leaked Flynn out of his office. They will not stop there. There is another, overlooked country where Flynn’s position as NSC influenced policy decisions. Flynn had at times lobbied for Turkey and good relations with the Erdogan government. Even on the very day of the presidential election an op-ed of his damning Erdogan’s enemy Gülen and lauding Turkey was published. The Russian’s will have taken note of such unreliable behavior. One wonders how Erdogan now feels as his lobbyist in a top position of the Trump administration is gone. If the Trump administration now acts against his plans will he creep back to Putin and ask for forgiveness? Would that be accepted? Flynn is no big loss for the world, the U.S. or the Trump administration. But Trump has now lost the initiative. He long managed to set the media agenda for the day by this or that “outrageous” tweet or remark. Now this advantage has been taken away from him over some nonsense allegations and his lack of backing for one of his top people.